No one is certain why the ancient Britons created ‘hillforts’. The name implies defence, but the scant signs of warfare cause some to believe that they were elaborate livestock compounds for summer grazing in the uplands. In which case they should be called ‘hill pens’. Others think they might be status symbols, rather like the bell towers of medieval cities in Italy, each one taller and more expensive than the rest, and one of them leaning precipitously. Since no one knows, I am free to have my own thoughts. Before the Romans, the lowlands were watery places, given to rivers, marshes, lakes and floodings. Up on the hills and downs you were literally above it all, the boggy ground and the biting insects. Tribal gatherings would have been held in high places, and the scouring of the White Horse, Uffington (now done by volunteers working under the direction of the National Trust) is a vestige of these annual events. One of the main, if not major, inter-tribal gathering place was Venonis. 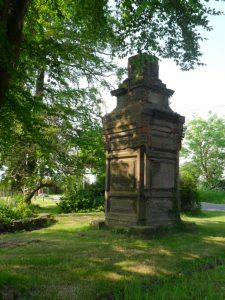 Sited where the Fosse Way crosses Watling Street (A5) in Leicestershire, it is now called High Cross. Once on a par with the meeting place of the Carnutes in Gaul, a hill now called Chartres, where they have built a cathedral, we have an enigmatic monument of the 18th century, unknown to those zooming past in their cars. 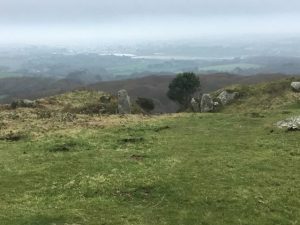 Since I first moved to Oxford in the 80s, White Horse Hill has been my healing sanctuary. After any bout of something or other, as soon as I can drive, I set off to Wantage, my pulse quickening as soon as I am on the B4507, the ups and downs and turns of it, leading ever closer to the great chalk figure of a galloping horse. The sight of it is great, but the healing comes once you are walking on the hill, the sun on your head, the breeze whipping your hair, eye to eye with kestrels, called windhovers. To watch the sun set, casting ever-deepening shadows into the runnelled hollow called the manger, is to feel peculiarly alive and part of it all. Now the healing is happening. A few years ago, I scooted off there at 4am to catch the sun rising at Beltane. I took a friend from Chicago. It was deep frost that morning and the hill was as white as the Horse. We’d arrived fifteen minutes too late to prove my theory that on that morning in early May, the sun for a moment hovers over Dragon Hill and, for that moment, the horse is pulling the Chariot of the Sun. I would have called my novel that, except it was too close to the title of my first, A Tabernacle for the Sun. 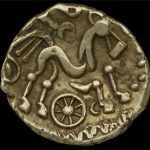 So it got called Chariot of the Soul instead. I have been to as many ancient high places as I can. Maiden Castle, of course, Hambledon Hill, Oswestry (where the forces of darkness are building a housing estate), and last November, Tren Crom which lies half way between St Michael’s Mount and St Ives. I thought I’d visited a lot of them. So imagine my surprise, dear reader, when last year the University of Oxford produced the magnificent online database, The Atlas of Hill Forts, and saw that they cover Britain like a furious case of measles. I suspect the promontory of Oxford at Carfax, overlooking the confluence of Thames and Cherwell, may have been a high place from which to watch for enemies while you ponder the mysteries of existence. For that is what hill forts mean to me, places halfway to heaven where you can have your feet on the earth and your head in the clouds, enjoying wide, expansive views that are elemental, even meterological some days. A place to escape the trivialities of daily existence and have time to wonder who you are. And just how long you’ve been coming to this place. Twitter for me is a party where I don’t know anyone. I pop in and out and don’t stay long. But I usually visit on Wednesdays. 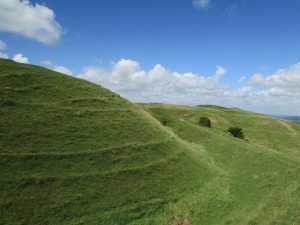 The rather wonderful Durotriges Project have nominated Wednesdays as hill fort days, and I enjoy seeing the tweets (#HillfortsWednesday). Surely one of the functions of these places was communication, tribe to tribe up and down the country, whether by beacon fires or just by calling (when the wind is in the right direction!). One thing I like about Twitter is a similar feature, where groups of archaeologists and local museums tweet or retweet each other, and I can wander in and out of their rooms, listening to all the gossip about the latest finds.